Our new series, Life At Communicate, looks at employees experiences working in recruitment. 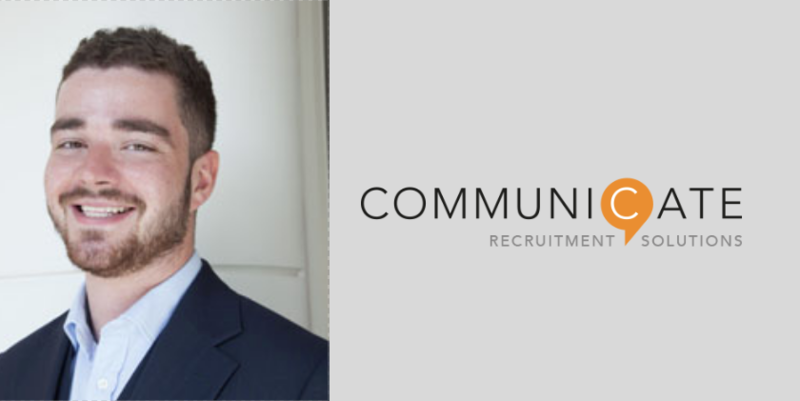 We sat down with Senior Appointments Manager, Joel Salomon, to discuss his time at Communicate. 1. What made you want to go into Recruitment? I really went into the unknown when I stepped into recruitment. I didn’t know exactly what the job entailed but there was the usual and slightly cliched reasoning to earn good money. However, the entrepreneurial elements of the job and the outward facing nature of the role made it appeal to me and this is why I decided to go into the industry. 2. What attracted you to working at Communicate? As soon as I met with the Senior Management team at Communicate, I immediately had a gut feeling that this was the right place for me. Communicate is filled with intelligent graduates and experienced recruiters who are passionate about the job – there is a real buzz and vibrancy to the office, making it a great environment to work in. 3. What does your role at Communicate involve? It really is 360° recruitment at its core. My day is never really the same and can vary from attending client briefs off site, to resourcing for roles and headhunting candidates from my desk. I also interview the candidates we are looking to put forward for roles and I’m often on the phone trying to picking up further work for the business. In addition, my role now encompasses managing the whole of the senior appointments desk – which has brought new responsibilities and aspects to my day. I really enjoy the process management side of the job, ensuring that both clients’ and candidates’ expectations are met and that an efficient hire is made. Matching a candidate to their ideal role is the best feeling you can get in this job and that is why I love doing what I do. 5. What is your biggest achievement on the job so far? I find it difficult to put my finger on a specific piece of recruitment that’s better than any other. I would say being our highest performing consultant for the last two years has been a proud achievement and really spurs me on to do the best that I can. I find it a great motivator to try and beat my personal best. 6. What has been your biggest challenge at Communicate? Without a doubt, the biggest challenge I have faced here was during my first six months. I didn’t make any placements at all in that time period and on average I was working from 7am-8pm. It was tough and at times felt like I was just hitting my head against a wall. However, after my first placement, it all clicked and fell into place, giving me the confidence to push through. I’m glad I stuck with it as it has really paid off. 7. What advice would you give candidates who want to get into recruitment? People will tell you that you need to possess tenacity to ensure longevity in this job, and I do believe this to be true. My advice would be to give recruitment a year of your time before making a permanent decision on whether you really want to go in another direction – it really does take time to build a network and I promise you, confidence comes with time. 8. What are your top tips for working in recruitment? Don’t view the job as your typical 9-5…although this isn’t a bad thing! Whether it be early morning coffee meetings or evening drinks after work, make sure you are always networking and growing your connections, as this will help you out in the long run. 9. What advice would you give to the candidates that you work with? I think the best advice I could give to anyone is to keep faith, both in the market and the recruitment industry. The market is becoming more and more fragmented, so it is crucial that you are well networked with the best agents in order to provide you with the best opportunities. 10. What hobbies do you have outside of work? Most weekends you’ll find me out on the golf course! Aside from that I manage a men’s 11 a side football team, which is great fun. I also spend my free time just catching up with friends. Look out for more Life At interviews with members of the Communicate team in the coming weeks on our Insights page.